After a traumatic abduction from her home as a child, Elizabeth Smart has used her life experience to share her story of perseverance in the face of unimaginable adversity. Elizabeth’s abduction and recovery continues to motivate parents, law enforcement and leaders worldwide to focus on children’s safety. Founder of the Elizabeth Smart Foundation, Elizabeth has also helped promote The National AMBER Alert, and provides awareness on child protection and safety across the country. Elizabeth’s advocacy for change regarding child abduction leads to her work in recovery programs in National Legislation. As a Bestselling Author, Elizabeth’s books are recognized for their power. 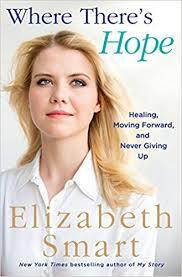 Recently, Elizabeth released a new inspiring book about what it takes to overcome trauma, called “Where There’s Hope.” Elizabeth’s purpose is clear, to help readers make peace with the past and embrace the future, by sharing how she did that in her own life. Elizabeth was one of the lead correspondents on creating a Survivors Guide: “You’re Not Alone: The Journey from Abduction to Empowerment.” Elizabeth personally embodies the phrase, “what doesn’t kill you makes you stronger,” and shares this encouragement with other young people who have gone through similar experiences. Want to book Elizabeth Smart? Visit eagles talent.com or call 1.800.345.5607 for more information. This entry was posted in Corporate Entertainment, Speaker Feature, Speakers Bureau Trends and News, Tips and Ideas and tagged 30 sec rec, 30 second recap, 30 second recap Elizabeth smart, Abduction Survivor, activism, activist keynote speakers, amber alert, best inspirational stories, best keynote speakers, best motivational speakers, best ted talks, corporate entertainment, Elizabeth Smart, Elizabeth Smart Foundation, encouragement, inspirational, inspirational advice, Journey from Abduction to Empowerment, legislation, legislative, overcoming adveristy, overcoming adversity speakers, personal stories of overcoming adversity, recovery story, social activism, speaker feature, survivors, TED Conference, TED talk, tips and ideas, Where There's Hope, Youth, Youth Issues, youth issues speakers. Bookmark the permalink.